Car versus pedestrian accidents are a huge public safety problem, particularly in densely populated cities. Pedestrians stepping out into traffic from between parked vehicles are to blame many times, as are distracted drivers who don’t yield the right of way to pedestrians. 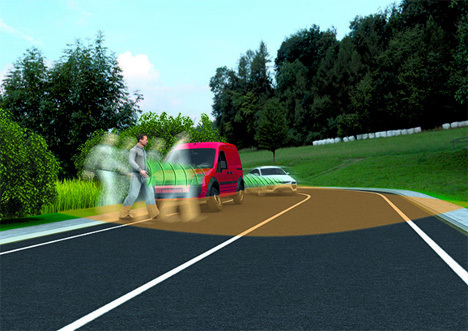 Researchers at the Technical University of Munich have developed a concept that could warn drivers before a pedestrian steps into their car’s path. 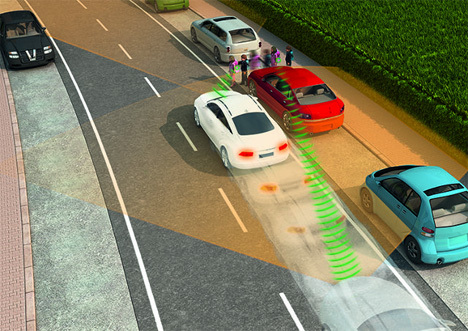 The Ko-TAG system is a two-part system, with one part being in the car and transmitting radio signals. The other half of the system depends on the pedestrian carrying a transponder that would communicate his or her location to oncoming vehicles. Since just about everyone carries a cell phone these days, the creators of Ko-TAG figured that would be the perfect place to stash the second half of the system. With the Ko-TAG in place, the driver can be alerted to the presence of a pedestrian who is likely to step into the street and cause a potential collision. If a collision is so close that it seems unavoidable, the system can apply the car’s emergency brake. There are some fail-safes built in, such as the system measuring the pedestrian’s speed and direction, so that someone standing on a corner waiting for a walk signal won’t trigger the Ko-TAG’s emergency braking system. See more in Futuristic or under Technology. February, 2014.